The series revolves around Flapjack and Cap’n K’nuckles. Flapjack is a young boy raised by a talking whale named Bubbie. Flapjack leads a peaceful life until the duo rescues a pirate by the name of Cap’n K’nuckles, who tells Flapjack of a place called Candied Island, which is made completely of candy. Inspired by the adventurous pirate, Flapjack, Cap’n K’nuckles and Bubbie get into strange predicaments and “misadventures” in search of candy, Candied Island and the coveted title of “Adventurer”. The three spend most of their time in Stormalong Harbor, their place of residence, and home to many strange characters. The Marvelous Misadventures of Flapjack Season 2 Episode 8 Down With the Ship – Willy! The Marvelous Misadventures of Flapjack Episode 4 Cammie Island – Shave and a Haircut… Two Friends! 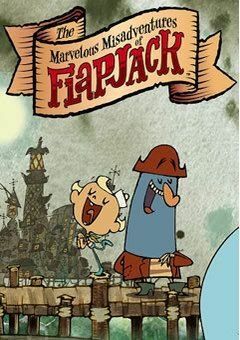 The Marvelous Misadventures of Flapjack Episode 3 Several Leagues Above the Sea! – That’s a Wrap!